I've had this tee shirt for 10 years+ and I love it. It was a gift from Uncle Keith and I even brought it with me from Australia to California, back from whence it came. It commemorates the celebrated swell of 1983 that hit the Californian coast creating great waves and much havoc. 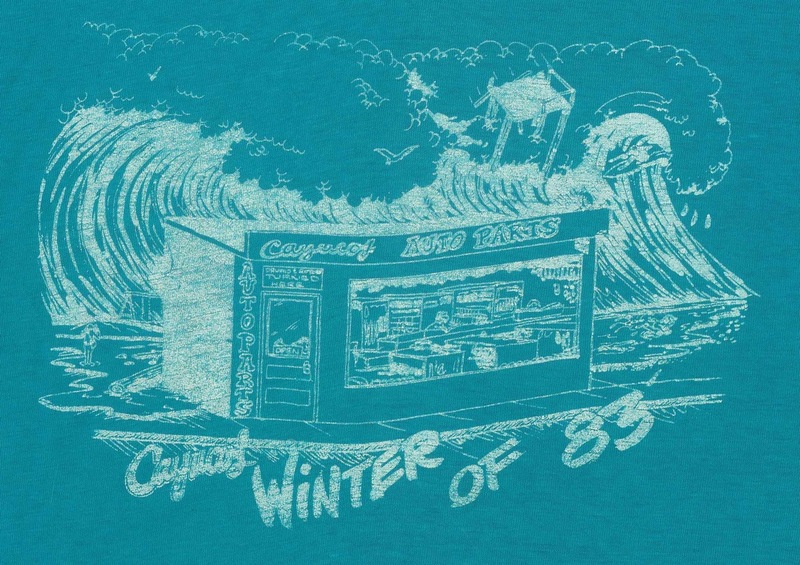 I love the little guy surfing in the drawing and the collapsing pier and auto parts store. I recently found an article on the above mentioned swell that I have reproduced below with pic of my beloved Swami's. I can tell its only a matter of weeks till I get like that again. were any of us prepared for such a drastic change that was to follow. Up until the second week of January, our climate had been cruising, and then, with our guard down, it just exploded. ln the final two weeks, five major low pressure storms rammed into California. This action continued through March 5th before subsiding. It would pick up again in an off-and-on pattern, but not with the same velocity. The typical behavior had a domino effect, with one mid-Pacific storm following another. Satellite weather photos proved the present and predicted the future. Nothing was to be spared in its path, pity the homeless and unprotected, advance and attack. You name it, the West Coast got it. No mercy. months, the drying out and rebuilding period began. Evaluating the damage, the box score favored mother nature. Beachfront damage of over 3,600 homes and around 750 businesses, State Parks, recreation facilities, parking lots, lifeguard headquarters and towers, were rn need of much repair. Sand erosion, due to the sea engulfing the beaches, spilled onto the boardwalks (strand), and in some cases the street. PCH through Huntington was closed for nearly a month, because storms had pushed sand onto the roadway. Each year, winter storms take away sand, and summer's wave action brings it back. With sand costing $7.70 a cubic yard, trying to replace the vast amounts eroded by the storm, would not be possible. Fortunately, summer is not far off, and maybe June will signal the beginning of our coast to widen out again. Piers: ln the South Bay, the concrete supported piers in Hermosa and Manhattan survived, along with the Redondo horseshoe pier, which has a deep water defense. But when support pilings weakened and gave way, extensive damage was the tally at Pt. Arena, Santa Barbara, Santa Monica, Venice, Palos Verdes, Seal Beach, Balboa, Huntington, Newport, San Clemente, and Ocean Beach. These long standing landmarks were among those hardest hit. Oil drilling platforms and derricks were not spared. Breakwaters: High combers also punched gaps in the breakwaters at Redondo and San Pedro, near Cabrillo Beach causing $4.5 million in damage. These rock walls were built to protect boating and shipping. With boats sinking or being damaged inside these exposed harbors, and others in Santa Barbara and Ventura closed because of sand built up around the entrance, priority aid was requested. Only two or three miles of the once heavily traveled 19 mile beach bike path in the South Bay, was left intact. Portions of the rebuilt pathway will have to be relocated further from the shoreline. Sea life: Even permanent guests of the ocean were forced to evacuate, as more than 130 seals and other sea mammals were deposited on the beaches. possible detour. From Eureka to Baja, rain was responsible for flash flood alerts. Coastal flooding due to runoff water from canyons and broken drainage systems would undercut pavement, causing roads to sink or wash out. and let you know who the boss was, by sending a tornado to sweep through three miles of South Central Los Angeles. damage to California from January 21 st until March 11. About 500 homes were completely lost, out of 8,382 damaged. Financial losses to agriculture have been $21 3.8 million, with thousands of acres underwater. lt's no wonder, sections from Los Angeles to San Diego were considered disaster areas. lf there is an explanation for all of this, Douglas lnman, Director of Scripps institute Center for Coastal Studies tries to. viewers, its really really nice article on building up new website.